PyCon 2017 was held about 45 miles south of Portland, Oregon where I am fortunate enough to live. I am typically not a great conference attendee so I was a bit nervous and apprehensive about going. After walking into the Portland Convention Center and being surrounded by 3,500 fellow Python enthusiasts, however, I was super excited. There were several amazing talks on a wide array of subjects. There were first time PyCon presenters like Jonas Neubert with a fascinating talk on using Python for factory automation. Along with some “heavy hitters” in the Python community such as Philip James and Daniele Procida. Daniele’s talk on documentation was very interesting and definitely a different way of thinking of of the documentation process. There were some really good keynote speeches as well. I really enjoyed learning from Lisa Guo on the migration path Instagram took to go from Python 2 to Python 3. I also found Dr. Katy Huff‘s talk on some practical applications for Python in the science field to be quite interesting. Kenneth Love gave a tutorial on the Django Admin which I would encourage people to work through as well. As usual it is a great presentation and Mr. Love provides excellent information. There were many other great talks, from many great speakers. The conference talks are available on YouTube here. I’d encourage you to watch, listen, and learn from as many as possible. There were some great vendors and businesses in attendance. Big companies like Google, Microsoft, Intel, and Facebook/Instagram were all there. They all offered some excellent short talks in their booths on how they were using Python for their applications or products. They also had a variety of swag they were giving away in exchange for a badge scan. Google had an hourly trivia session and provided prizes for the correct answer. I picked up a copy of Python in a Nutshell: A Desktop Quick Reference for knowing that PyCon 2018 would be held in Cleveland, Ohio. Intel had several drawings for an Amazon Echo , along with several other vendors actually. Booz Allen Hamilton had several drawings for a Raspberry PI 3 Model B which I sadly wasn’t able to win. Company branded socks were one of the big swag things at PyCon, beyond the t-shirts, stickers, and fidget spinners. 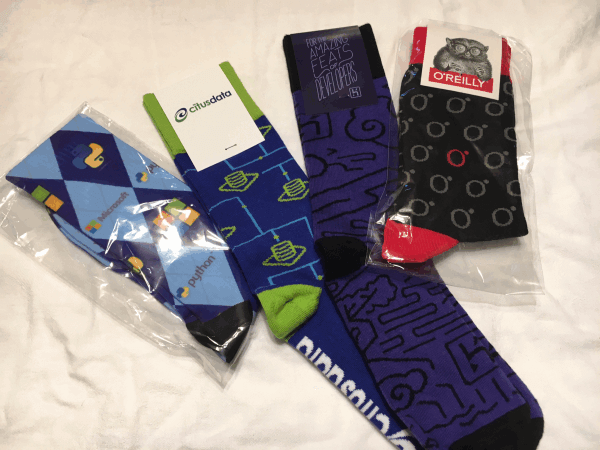 Microsoft, O’Reilly Publishing, Citus Data, and Heroku all had custom socks. Scan your badge… get socks. In addition to the great learning opportunities the talks provided, and the interaction with sponsors, another key feature of any conference is the people. The opportunity to get to meet and talk with people like Andrew Pinkham who authored Django Unleashed , or Russell Keith-Magee of BeeWare was spectacular. Having the chance to meet and talk with other developers about industry trends was great as well. I have heard that the Python community is second to none in terms of inclusiveness and I was able to witness first hand that is indeed the case. Due to the exceptional overall experience I had at PyCon 2017, I am sincerely hoping that I can make to the trip to Cleveland in 2018.